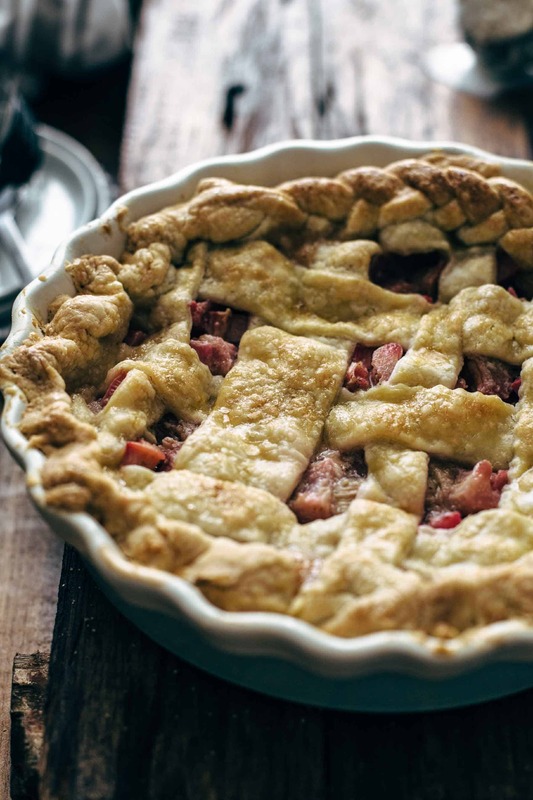 Celebrate rhubarb season with this easy Rhubarb Pie recipe from scratch. Super easy and ultra-flaky pie crust made from scratch with just 5 ingredients. 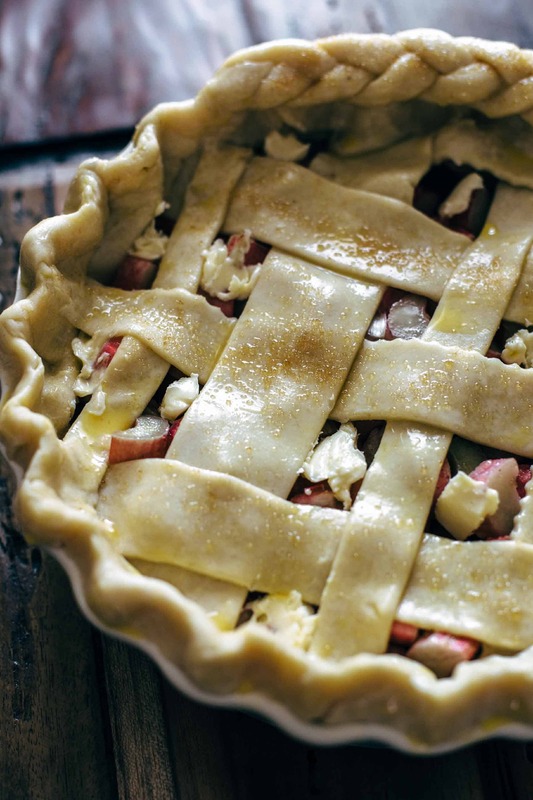 Filled with irresistible rhubarb filling. Prepared in 15 minutes with just 10 ingredients in total. Before we jump into the today’s ultra delicious finger-licking Rhubarb Pie recipe, I just want to say that I’m so happy to be back again. I took a break from blogging last week, as you may notice. But not a voluntary break. I had to learn so much for my exams, which I had on Friday and Saturday last week. I literally thought my head explodes. Controlling, consumer psychology, and marketing conception. Guess which of these three was the subjects I struggled the most with? Correct, controlling. This week is everything back to normal. 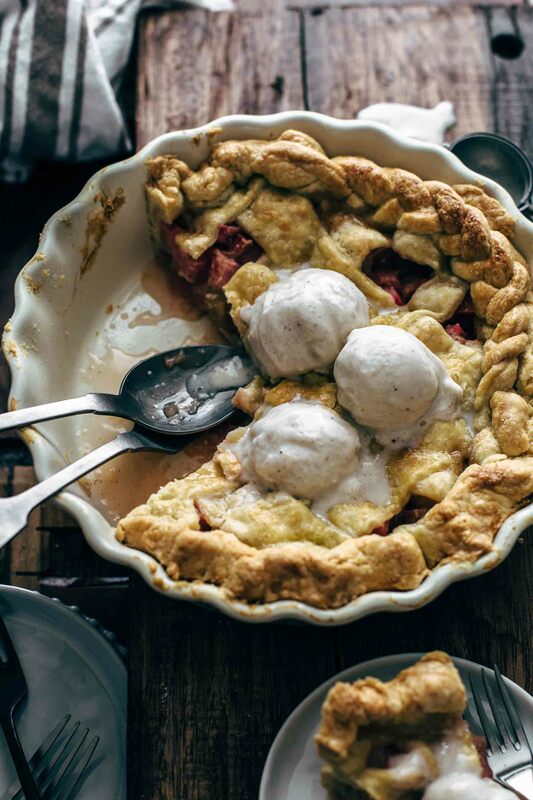 And because the weather is getting warmer and warmer, my cravings for pie, rhubarb, and ice cream are rising endlessly. 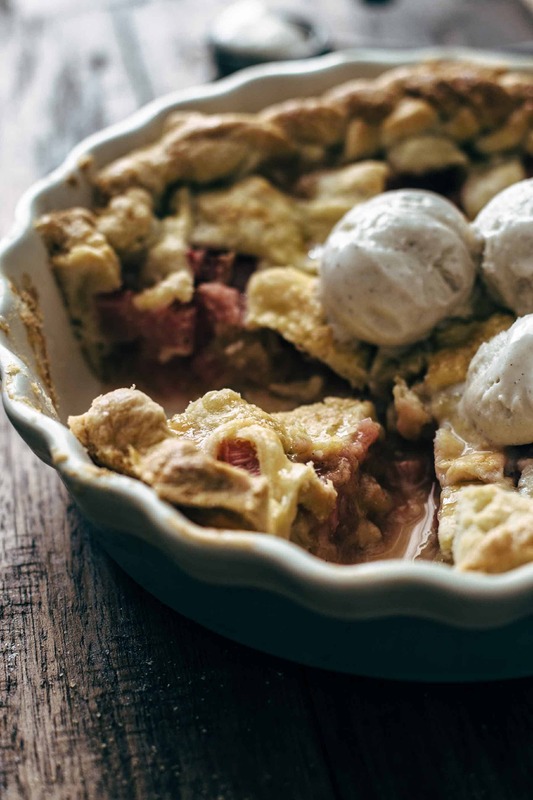 So I had to make this awesome Rhubarb Pie and topped it with lots of vanilla ice cream. Oh yes, it is as delicious as it sounds. Pie crust is so easy to make that there is definitely no reason to use a store-bought pie crust. But I wouldn’t blame on anyone who wants to go with store-bought pie crust. So if you are on the pro-store-bought-pie-crust team let me convince you to play on the pro-pie-crust-made-from-scratch team. 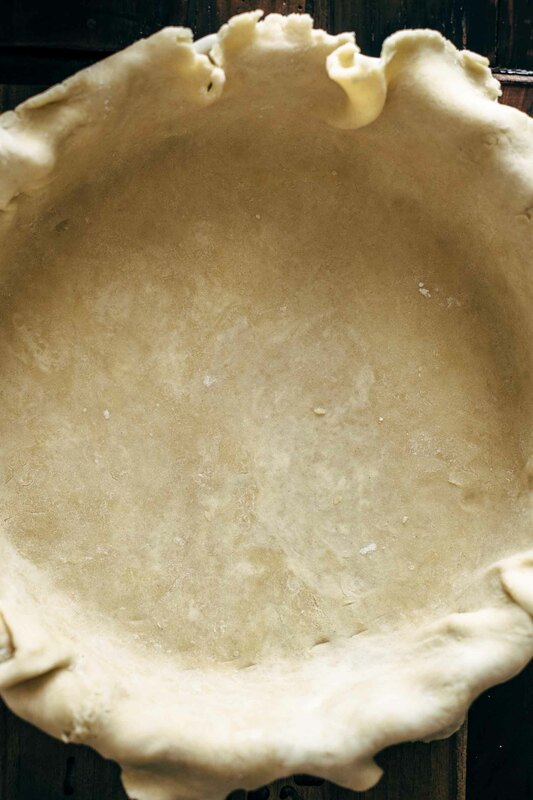 To make pie crust from scratch is a very, very easy and quick process. Just 5 ingredients and 2 minutes preparation time needed, if you have a food processor. This is by far the fastest way to make pie crust. Therefore, place butter, flour, salt, and sugar in the food processor and pulse a few times. Butter flakes and chunks should be still visible. Then add water little by little and pulse until it starts to clump and pea-sized butter flakes are still visible. The butter shouldn’t be completely worked into the dough because the butter flakes are the reason why a good pie crust is flaky. If you don’t have a food processor, then use a pastry cutter or two forks to make the pie crust. In this case mix together flour, salt, and sugar in a large mixing bowl. Then add butter and cut it into the mixture until it resembles coarse meal with pea-sized butter flakes. Then add water little by little until the texture starts to clump. Then divide into two halves and form into 1 – 1.5-inch thick discs without kneading. Chill the dough for two hours or up to two days. 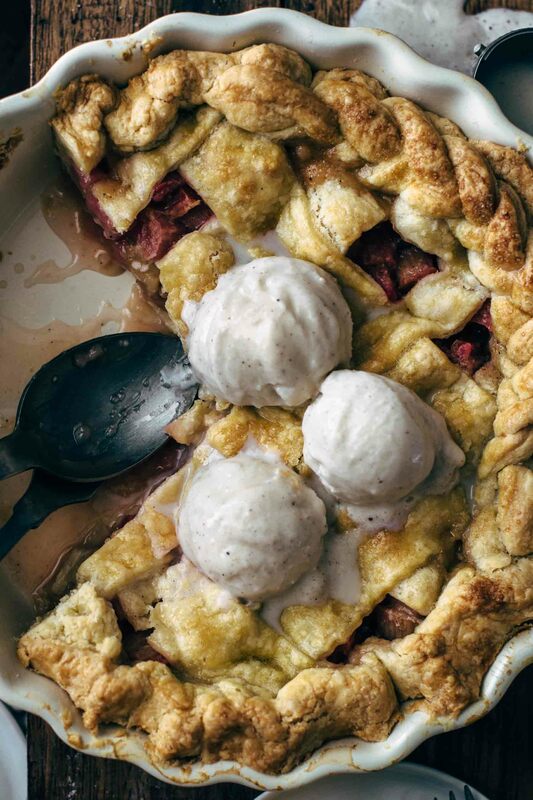 Do you see that marbled pie crust (photo above)? This is when there still are butter flakes in the dough. This leads to a super flaky pie crust. The filling is easy-peasy. Just stir everything together in a large bowl until the rhubarb is evenly coated with the dry ingredients. That’s it. Then roll out the first dough disc, transfer to a pie dish and fill with rhubarb filling. Cut 1 tbsp of butter into small pieces and place on top of the filling. Then roll out the second dough disc and cut into 1-2 inch strips to your preference. Arrange in a grid or any pattern you like. Seal and flute the edges. You can also make a braid with thin pie strips and lay it over the edges if you like. Or cut out some figures with cookie cutters and lay on top. The decoration possibilities seem endless. Brush with egg, sprinkle with brown sugar and bake. Don’t forget the vanilla ice cream on top! 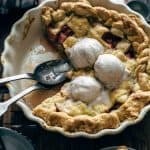 If you make this easy Rhubarb Pie recipe from scratch, leave a comment, rate it and tag a photo #alsothecrumbsplease on Instagram! Would love to see your snap! 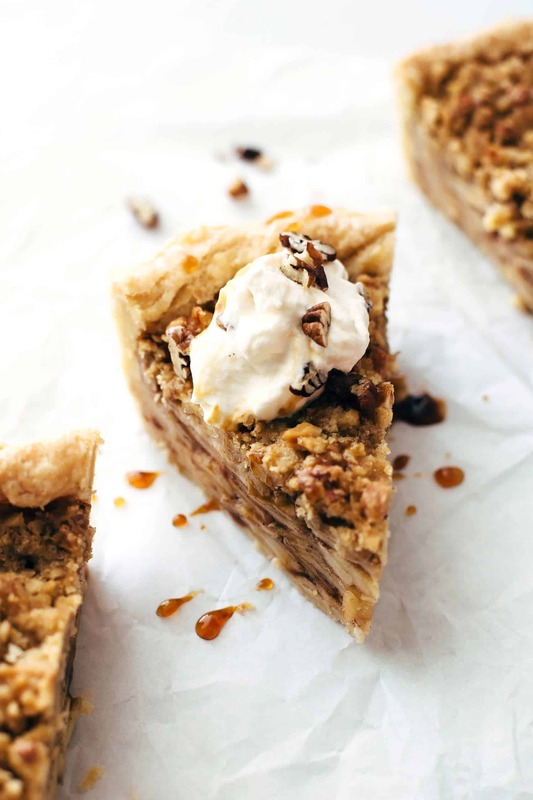 You may also like Super easy Apple Walnut Pie, Mini Apple Caramel Pies, Banana Cream Pie, Churro Hand Pies, or click here to see all things sweet. Make it with a food processor: Place cold butter, flour, salt, and sugar in a food processor and pulse 4-5 times. Pea-sized butter flakes should still be visible. Add one tablespoon water after another and pulse 1-2 times after every tablespoon. Stop adding water when the dough starts to clump. If you don't have a food processor, then make it with a pastry cutter or two forks instead: In this case mix together flour, salt, and sugar in a large mixing bowl. Then add butter and cut it into the mixture until it resembles coarse meal with pea-sized butter flakes. Then add water little by little until the texture starts to clump. Divide pie crust into two halves and form 1 - 1.5 inch thick discs without kneading. Cover tightly with plastic wrap and refrigerate at least 2 hours or up to 2 days. In a large bowl stir together both sugars, cornstarch, and salt. Add rhubarb and vanilla* and stir to combine. Set aside. On a lightly floured surface roll out the first dough disc into a 12-inch circle. Transfer to a 9-inch pie dish. The edges of the pie crust should hang out of the baking form. Add filling. Then cut butter into small pieces and put on top of the filling. Roll out second dough disc and cut into 1-2 inch strips. Arrange strips in a grid on top of your filling and lay over and under one another carefully. Seal and flute the edges. Brush with egg and sprinkle with brown sugar. Bake for 45-50 minutes. Cover the first 20 minutes with parchment paper to prevent it from browning too much. Let cool to room temperature and chill for 4 hours in the fridge. Store leftovers in the refrigerator up to 3 days. I always knew you were highly talented and smart, Sabine. I can tell by how you structure your website and how you take photos–not to mention your incredibly delicious recipes you dream up. May I ask–since I am fascinated to have landed on the page of a genius–what are you studying for, or what major/degree are you pursuing? You are so gifted…whomever you work for is very lucky to have you. I’m studying economic psychology. It’s a bachelor degree, and I’m already in the 4th out of 6 semesters. This is not my first study, I’m already an MBA but I wanted to have a marketing specialized degree, so I’ve decided to study again. You amaze me, Sabine. I am so lucky to have somehow come across your website. I should probably be exclaiming, “Wow! You are so smart,” but I already can tell that from all that you put out for the world to see–and you are incredibly hard-working. I have come across a few people like you (i.e. highly gifted and talented), and it is always an inspiration to know that there truly are good, brilliant, tenacious people in this world. And please do not blush from my compliments (even if it sounds like I am fawning over you.) I am just purely and simply highly impressed. I wish I could bake a loaf of bread. Maybe I will start with one of your banana bread recipes one of these days. Economic psychology sounds fascinating. Can’t wait to see what else you contribute to this world. Amanda, this means so much to me I can’t tell. I’m speechless and this literally never happens. I’m beyond happy that you like my work and my blog. If you need any help with any recipe, just let me know. I’m happy to help. Banana bread sounds great and is easy to make. I’m sure that you will bake a delicious one. Thank you so much for your support, Amanda.